¡Buenos días a todos y todas! 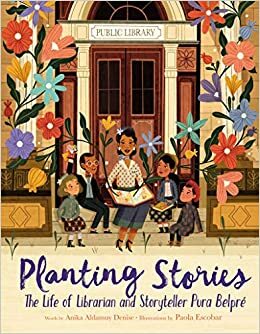 Last week we announced the 2017 Américas Award recipients, and today I will continue highlighting Latinx children’s and young adult literature with the 2017 Pura Belpré Award Winners. The Pura Belpré Award is named after the first Latina librarian at the New York Public Library. Like the Américas Award, it is an award which we regard highly within the world of Latin American/Latinx children’s and young adult literature. 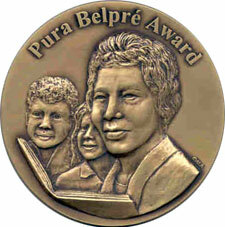 According to the Association for Library Service to Children website, the Pura Belpré Award, established in 1996, is presented annually to a Latino/Latina writer and illustrator whose work best portrays, affirms, and celebrates the Latino cultural experience in an outstanding work of literature for children and youth. It is co-sponsored by the Association for Library Service to Children (ALSC), a division of the American Library Association (ALA), and REFORMA, the National Association to Promote Library and Information Services to Latinos and the Spanish-Speaking, an ALA affiliate. Below you will find the 2017 Author Award Winner, Illustrator Award Winner, Author Honor Book and the Illustrator Honor books. The 2017 Pura Belpré selection committee included Chair Eva Mitnick, Los Angeles Public Library; Marissa Alcorta, Pima County Public Library, Tucson, Ariz.; Laura Duncan, Oxnard Public Library, Oxnard, Calif.; Cyndi Giorgis, University of Texas at El Paso; Linda M. Pavonetti, Oakland University, Rochester, Mich.; Lettycia Terrones, Los Angeles Public Library; and Junko Yokota, Center for Teaching through Children’s Books, Skokie, Ill.
Stay tuned for Mira, Look! posts featuring these books among others. Also, we highly recommend visiting the award website to see a list of previous medal winners. We hope these books will make it to your classrooms! Also, stay tuned for a post about the Tomás Rivera Book Award recipients next week! Juana & Lucas presents with breezy humor the day-to-day reflections and experiences universal to childhood—school, family and friendships—through the eyes of the invincible Juana, growing up in Bogotá with her beloved dog, Lucas. This charmingly designed book for young readers portrays the advantages—and challenges—of learning a second language. “Juana’s transformation from frustrated learner to enthusiastic speaker of ‘the English’ is portrayed with authenticity and plenty of appeal,” said Mitnick.